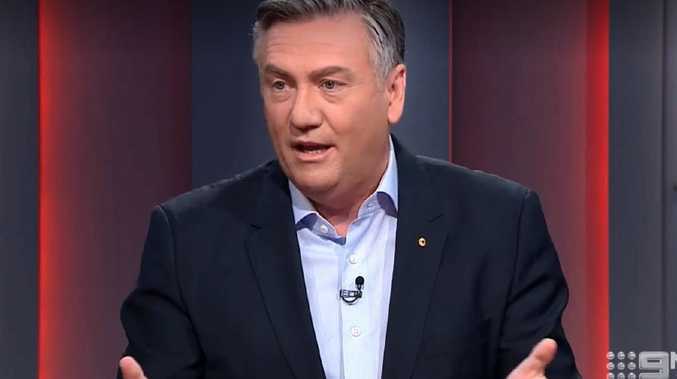 EDDIE McGuire has come out swinging when forced to re-visit his club's 2017 review which threatened his future as Collingwood president. The Channel 9 commentator traded barbs with veteran footy journalist Caroline Wilson during a heated stroll down memory lane on Nine's Footy Classified on Tuesday night. The two outspoken AFL media personalities have regularly clashed in recent years, spiking in 2016 when McGuire was criticised for appearing to joke about wanting to drown Wilson. They rumbled again on Tuesday night when McGuire took exception to Wilson's public comments about his endangered future as Collingwood president during the club's 2017 review was conducted by football manager Geoff Walsh. McGuire's position as club figurehead was up for debate - as was coach Nathan Buckley's future. According to reports, the roles of more than 40 staff were changed as a result of last year's review. However, the end result was Buckley being handed a two-year contract extension and McGuire staying on with the intention to see out his full term as president through to the end of 2019 - and possibly even longer. Wilson was last year highly critical of McGuire's impact on the club's turbulent football department where it was claimed assistant coaches feared for their job security and other staff were marginalised. Caroline Wilson and Garry Lyon on the old set of Footy Classified. McGuire defended himself when asked to revisit the club's decisions last year - which formed the backbone of the Magpies' emphatic climb to this year's grand final after four straight years of failing to play finals. 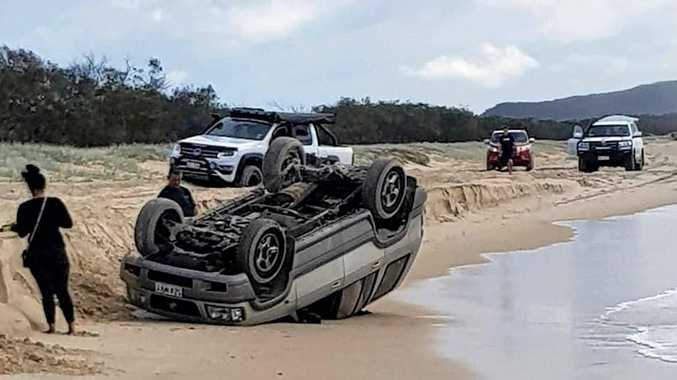 Wilson's accusations centred around McGuire's supposed failures to create a stable football department following former football boss Neil Balme's move to Richmond at the end of the 2016 season and Graeme Allan's recruitment as football manager just weeks before he was suspended by the AFL for 12 months for his actions during GWS Giants star Lachie Whitfield's attempt to dodge a potential drug test. "You were a mess two years ago, Ed," Wilson said. "And you were a mess last year. And people who love your club have come back and helped fix it. Certainly this time around, (you) have picked good people. McGuire later responded: "In 2008, the first time you said I should have been sacked, we won the flag two years later and made a preliminary final the next year. "What I'm saying when things aren't necessarily going right on the ground, doesn't mean they are not going right." McGuire then had to deny ever having a conversation with Buckley about the coach needing to lift his performance or face the sack. 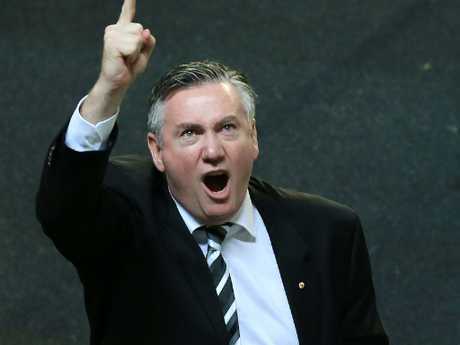 Eddie McGuire being Eddie McGuire. "Never, because we have an open adult relationship where it is absolute unadulterated respect for each other," he said. "It doesn't mean we agree on everything all the time, but we absolutely respect each other. There's one thing that all those people that have been mentioned, all those names - they only wanted the best for Collingwood. That's why you could have those decision and move things around." Wilson also forced McGuire to defend his own performance as president, declaring McGuire had at one point recently "lost his way". He admitted his football club had to endure an uncomfortable transition period last year after the review identified areas where staff and coaches needed to adjust or do things differently. However, he was adamant that discomfort should not reflect poorly on his administration because his club is now in a grand final. 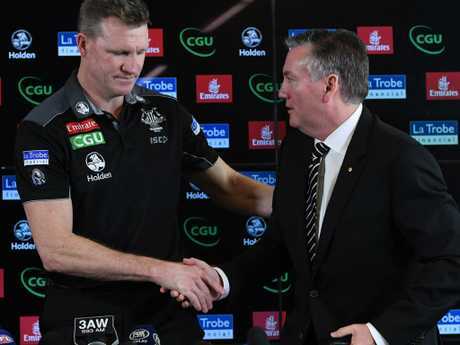 Eddie McGuire said he knew all along Nathan Buckley was his man. "What we wanted to do was get the people, because we were clunking gears," he said. 'So I'm not criticising what you wrote, I'm just saying look at it the way we were looking at it. "Tonight we're trying to explain where we got to. It's a lot more sophisticated and a lot more caring in that situation. So people weren't being demoted, we were trying to find right spots for them. It was clunky for a bit." McGuire recently told The Herald Sun he also briefly thought about resigning from his post last year - following a loss to rivals Carlton. Saturday's grand final marks 16 months since McGuire contemplated his future after the loss to Carlton. They say a week is a long time in football. What a difference 16 months makes.